Republican plans could raise insurance premiums by 750 percent for some. There are lots of losers under the Republican plan to replace Obamacare, but perhaps nobody would suffer as badly as older Americans who live just above or around the poverty line. 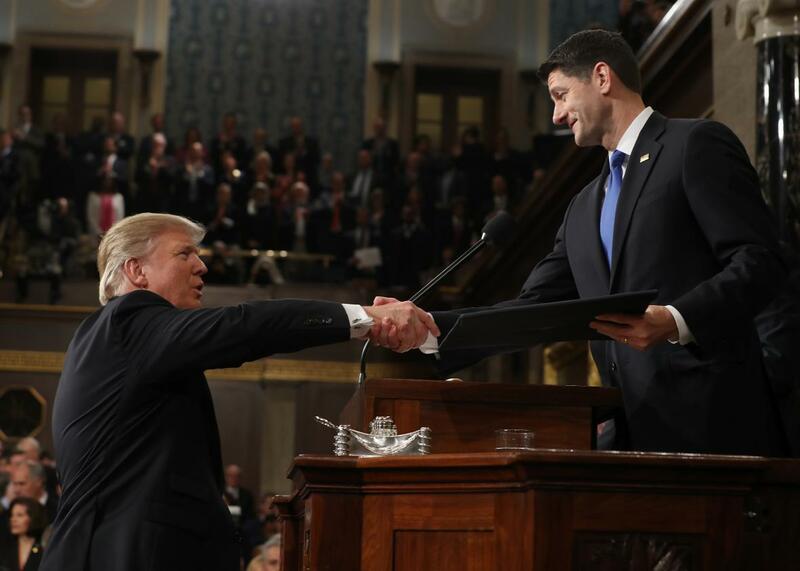 According to the new estimates from the Congressional Budget Office, that group could see its insurance premiums rise by 750 percent within a decade under the House GOP’s American Health Care Act, compared with what they’d pay under current law for more comprehensive coverage. Yes, 750 percent. That’s not a typo. That devastating increase is spelled out in the table below, in which the CBO models how premiums might change for Americans of different ages and incomes under the legislation Republicans have proposed. With Obamacare, a 64-year-old earning $26,500 per year in 2026—175 percent of the poverty line—would have to pay $1,700 for insurance, after tax credits. That plan would cover 87 percent of their medical costs, on average. Under the AHCA, or Trumpcare, that same person would owe a full $14,600 after tax credits for a plan that only covers 65 percent of their medical costs. Suffice to say, an almost-senior citizen cannot afford to pay 55 percent of their income for health insurance. Why the drastic increase? There are two main reasons: Under Trumpcare, insurers would be allowed to charge older Americans more, while the government would give lower-income Americans smaller subsidies to pay for coverage. Currently, insurers are only allowed to charge older customers three times what they charge younger individuals. The Republican plan would allow them to charge five times as much. Meanwhile, under the Affordable Care Act, the federal government gives people tax credits based on their income and the cost of insurance, which cap premiums as a percentage of their earnings. Trumpcare’s premiums are only based on age—they don’t take income or cost coverage into account—so poorer households tend to lose out. They’re also set to grow more slowly, which doesn’t help matters. There are some winners in this bargain. Obamacare doesn’t offer premiums subsidies for households that earn more than 400 percent of the poverty line. So some middle- and upper-middle-income Americans may come out ahead. 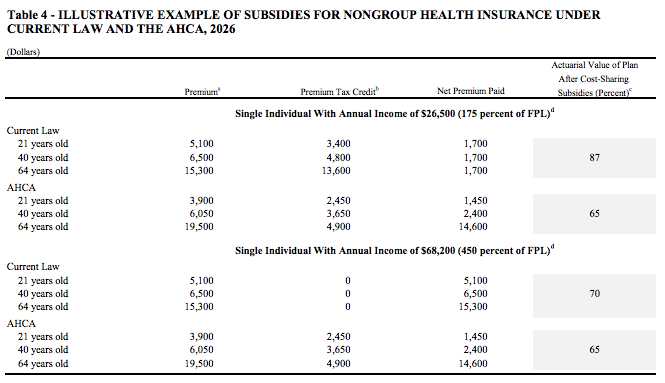 A 40-year-old making $68,200 in 2026 would pay $6,500 under Obamacare; with Trumpcare’s tax credit, he’d pay just $2,400 for an insurance plan that was only slightly less comprehensive. A 21-year-old with the same salary would benefit similarly, while a 64-year-old would pay slightly less than under Obamacare. The CBO has often been criticized—perhaps unfairly—for its estimates about Obamacare’s coverage effects. But its budgeteers were largely on target regarding the Affordable Care Act’s effects on premiums. Republicans are already objecting that the office’s estimate did not account for the way deregulation through the executive branch will bring down costs, by allowing insurers to sell less expansive policies. But that doesn’t help older Americans with significant medical costs much. And as I mentioned before, these premium comparisons assume customers will buy far less comprehensive coverage. There’s every reason to believe the projections on this table are at least directionally correct about what the effects of Trumpcare would be. So you could call it a trade-off. Younger, higher-income Americans pay less, while older, poorer Americans—many of whom are likely Trump supporters—pay far, far more for less useful insurance. This is part of a bill, mind you, that would force many of these lower-income households into the individual market by cutting hundreds of billions from Medicaid. These trade-offs might be less severe if Republicans weren’t determined to turn their legislation bill into a vehicle for massive, regressive tax cuts. But hey, everybody has their priorities.